So I managed to get the remote desktop connection working to my work computer. Unfortunately as you can see, that required a few layers. 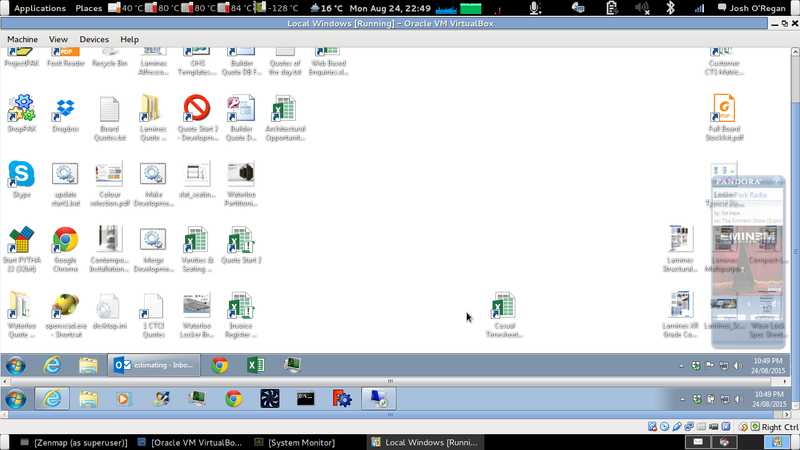 At the bottom of the screen is my Debian taskbar, then running within virtualbox is the windows install on the other partition of this computer. Then within that is an RDP connection to my work computer at the office. Probably the most impressive thing about this whole setup is how good the performance was. It felt like I would still be able to use it for doing actual work. I am in the process of finding an alternative that will run natively within my Linux install and I have found this program http://remmina.org/ that will do RDP through a TS Gateway which is causing my headaches. Unfortunately the ppa I found for it is only for newer versions of Ubuntu than the version of Debian I am using. So I can either compile from scratch and probably have to sort out a whole lot of dependencies. Or I can update in place this install of Debian I am using now. Or I move to a distro with rolling updates like Gentoo which I was going to use but then needed a working install far to quickly. I'll let you know what I end up doing. And particularly if it is a bit interesting I will do a writeup on it. If anybody has a suggestion as to how I should proceed let me know what you think and why.